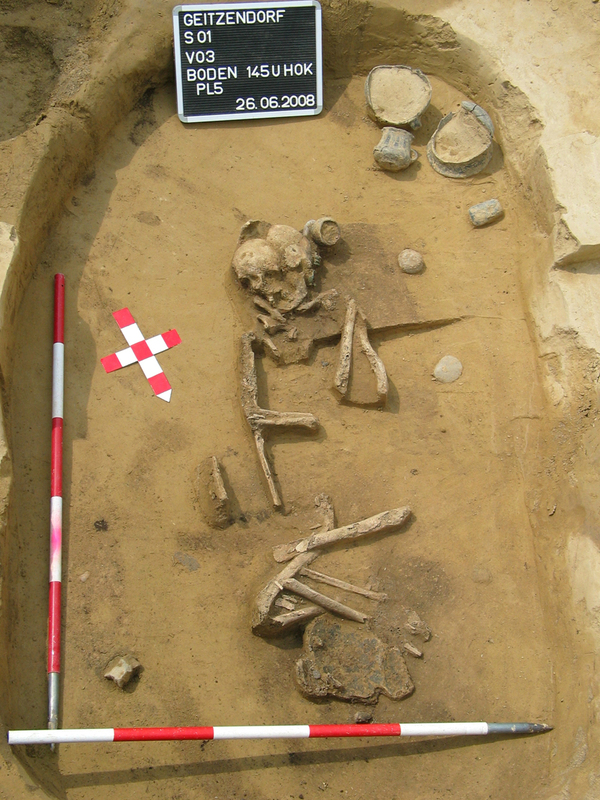 The burial of a mature woman, aged between 45-60, was uncovered along with 14 other early Bronze Age graves during excavations by the Austrian Museum of Ancient History at Geitzendorf, northwest of Vienna. She had been laid to rest with four stone tools, including anvil- and hammer stones. When found in male burials, Lower Austrian state archaeologist Dr Ernst Lauermann said, these artefacts are interpreted as metalworking tools, probably used for making jewellery. ‘It was normal in those days for a person to be buried with the items that were part of their daily working lives,’ he said. Lying in a crouched position, the woman’s pelvis was missing, but archaeologists identified her as female by features of her skull and lower jaw. On either side of her head were small pieces of jewellery, including studs and rings – perhaps made by the woman herself. Dr Lauermann added that further investigations could uncover more graves on the site. ‘In my opinion, this kind of cemetery would have between 18 and 20 graves,’ he said.